The Stunning Re-Issue of this Disturbing Underground Masterpiece from 1980! 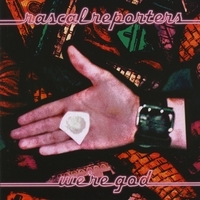 Wafer Face Records continues their reissue series of ultra-rare Rascal Reporters cassette-only releases with this 1980 gem, generously remastered with various bonus tracks, including the ultra-rare 1981 single "Guns For Jerry's Kids"! More lovely and damaged analog compositions from the two Steves (Gore and Kretzmer)...75 minutes of music! Thanks to a special arrangement with Wafer Face, we can now offer this unusual piece of underground music history through Hebbardesque/CD Baby!